Tray Folder is a launcher. Start the program and an icon will appear in your tray displaying the date. 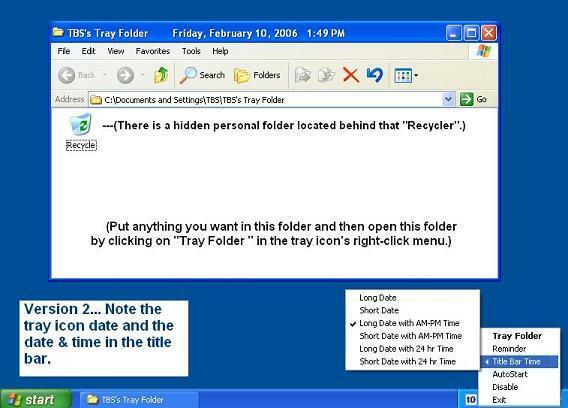 Right-click on the tray icon to open your tray folder or to use the program's other features. Store whatever you want in your tray folder. Hide files and folders. Your tray folder is an excellent launcher of programs, files, and folders of your choosing. ...... No dancing bears trying to sell you something that you do not want or need. But, it is an excellent launcher of programs, files, and folders of your choosing and it has plenty of extras. One extra gives you the ability to hide files, or folders, in your tray folder behind a Recycle Bin. There is also a 'Titlebar Time' feature which you can use to have the day of the week, the date, and the time displayed, in various formats, in the active window's titlebar. Your personal tray folder will adopt the name of the profile under which it was created. For instance, my tray folder's name is- John's Tray Folder. Your tray folder will be located under your profile name on the hard drive. You have the option to auto start Tray Folder when windows starts. This really is a nice piece of software and the registered version is only $ 4.98. No splash screen, no advertisements, no spy ware, or ad-ware. Customize, replace or change folder icon. Qweas is providing links to Tray Folder 2.03 as a courtesy, and makes no representations regarding Tray Folder or any other applications or any information related thereto. Any questions, complaints or claims regarding this application Tray Folder 2.03 must be directed to the appropriate software vendor. You may click the publisher link of Tray Folder on the top of this page to get more details about the vendor.